Cal-Mil 1153-46-74 Silver One by One Metal Magnetic Sign Display 46"
TigerChef > Smallwares > Restaurant Signs > Message Centers >< Sign Stands and Poster Holders > Cal-Mil 1153-46-74 Silver One by One Metal Magnetic Sign Display 46"
$64.99 Cal-Mil 1153-15-13 Black One by One Metal Magnetic Sign Display 8-1/2" x 11" x 15"
$64.99 Cal-Mil 1153-15-74 Silver One by One Metal Magnetic Sign Display 8-1/2" x 11" x 15"
$115.63 Cal-Mil 1153-46-13 Black One by One Metal Magnetic Sign Display 46"
$85.99 Aarco Products TY-2CH Director Sign Stand Silver 54"
$92.99 Aarco Products TY-2B The Director Changeable Poster Sign, Gold 54"
$88.99 Aarco Products TY-2BK Director Sign Stand Black, 54"
$88.99 Aarco Products PFS1114 Changeable Poster Sign Black Frame, 54"
Use the Cal-Mil 1153-46-74 Silver One by One Metal Magnetic Sign Display 46" to show off your menu and promotions, and for displaying other announcements at your restaurant or other food service establishment. This piece features a freestanding design and a height of 46" which will enable you to place it almost anywhere. 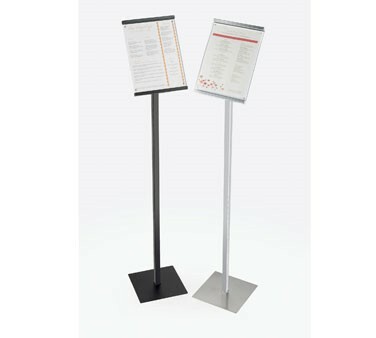 This food service essential is equipped with a magnetic front to hold your display securely, while its tilted angle provides excellent visibility so your guests or customers can quickly read what's written on it. To ensure stability, this magnetic sign display is built with a square base. Thanks to its sturdy metal construction and elegant silver color, this One by One metal magnetic sign will complement any setting and is durable enough to withstand years of high volume use. Holds menus 8-1/2" x 11"